Tamil Nadu state has the distinction of 719 MW capacity windfarms at the end of September 1998 out of the country’s total figure of 992 MW. Andhra Pradesh has 59 MW installed windfarms in the state. 1995-96 saw a boom when 282 MW windfarms were set up in Tamil Nadu and 39 MW capacity in Andhra Pradesh. Subsequently there was a steady decline in the windfarm development in both the states. This case study attempted in detail to trace the reasons for the boom and the factors that contributed to the slump in windfarm activity in the states. The role of institutions in determining the effectiveness of National and Regional public-sector initiatives to promote and disseminate wind energy in the two states is discussed in the paper. The study has also looked into the financial, technical, transaction and institutional barriers which inhibit the diffusion of wind energy in the states. Creation of Wind Fund, establishment of co-operative windfarms, setting up of wind estates, linking generation to incentives for optimum production, promotion of reliable water pumping windmills and wind battery chargers for small scale applications suggested in the paper for rapid growth of wind energy in Tamil Nadu and Andhra Pradesh. The results of the case study may be used to improve public policy intervention in disseminating wind energy in the country. It may also be relevant to multilateral and bilateral aid agencies in their projects and / or programmes to promote cost-effective wind energy technology dissemination in developing countries. Renewable Sources of Energy have a vital significance in the context of growing concern about sustainable energy supplies and protection of the environment from adverse effects of fossil fuel utilisation. The current pattern of energy consumption and the growing energy requirements on account of development, economic growth, population increase etc., are considered to be essentially unsustainable. The staggering increase in oil import burden, the crippling effects of power shortage and the deterioration in environmental quality are some of the critical issues facing India today. Worldwide, vast amounts of carbon-di-oxide and other greenhouse gases that are being dumped into the atmosphere by fossil fuel burning and other economic activities are causing grave concern about the possible global warming and attendant consequences. It is becoming increasingly clear that any effective strategy to contain global warming must involve rational and efficient use of energy and a gradual transition from reliance on fossil fuels to alternative, environment friendly energy technologies. A major component of this strategy will admittedly be the promotion of renewable energy systems in a big way, and in this scenario, wind energy is expected to figure prominently. Among the renewable energy sources, wind is the most matured one. In India wind energy was first tapped in the 1950s for its potential to pump water for domestic use and irrigation as an alternative to diesel/electric pumpsets. Wind pumps were imported on a modest scale and installed on an experimental basis at a number of sites. A National Water-Pumping Windmill Demonstration Programme was subsequently introduced by the Government of India during the 6th (1980-85) and 7th (1986-91) plan periods and about 2800 units of the 12-PU-500 wind pumps for shallow well water pumping were installed around the country. In addition, over 200 indigenously developed gear type pumping units have also been installed in 9 states under an Operational Research Programme (ORP). Unfortunately due to various technical and non-technical reasons, the 12-PU-500 could not succeed except in some regions. The programme for demonstration windfarms was initiated in 1985. Since 1992 private investors/developers took lead in setting up commercial wind power projects in the country. Since Tamil Nadu state has become the leader in windfarm installations in the country an attempt is made to study in depth the factors that contributed to the early growth and the pitfalls that led to the slump including institutional barriers besides a comparative study with wind power developments in Andhra Pradesh, a neighbouring state. A package of incentives have been offered by the Central Government such as accelerated depreciation, tax holiday, soft loans, custom and excise duty reliefs, liberalised foreign investment procedures etc., Private investors/developers took advantage of these incentives and set up windfarms. 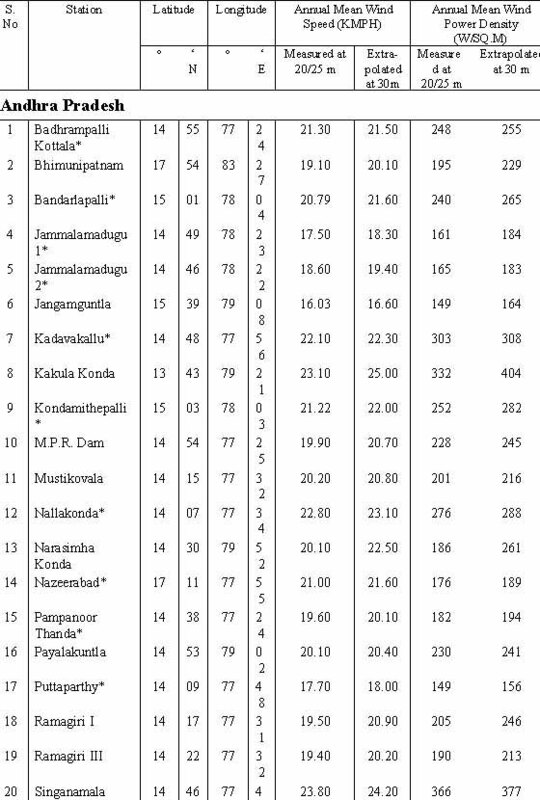 The list of wind sites with their latitudes and longitudes annual mean wind speeds and annual wind power density measured at 20/25 m height and extrapolated to 30 m height in Tamil Nadu and Andhra Pradesh are given in Table 1. 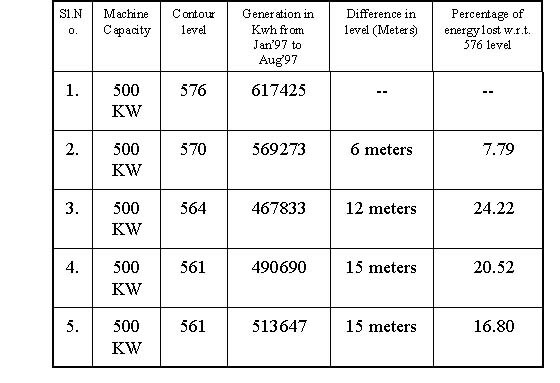 The wind energy potential and the resources exploited till the end of September 1998 are shown in Table 2. (a)	assuming 0.5 per cent of land availability for Wind Power generation in potential areas. (b)	as on 31.03.98, assuming 20 per cent grid penetration. 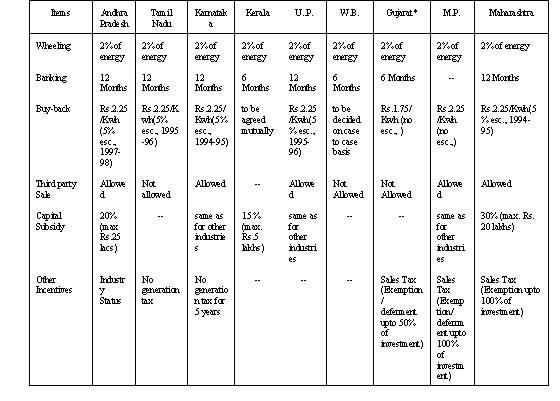 State -wise and year-wise wind power capacity addition (MW) in India is shown in Table 3. 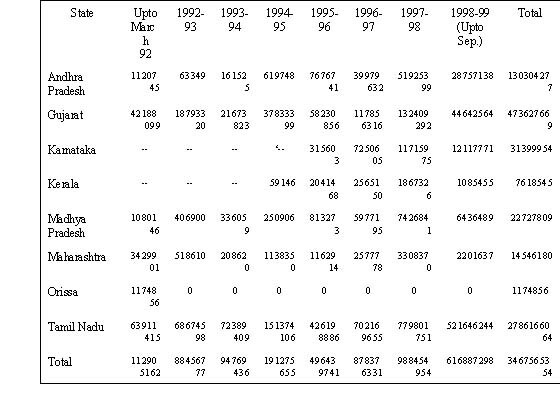 The power production state-wise and year-wise in the country through windfarms upto September 1998 is shown in Table 4. 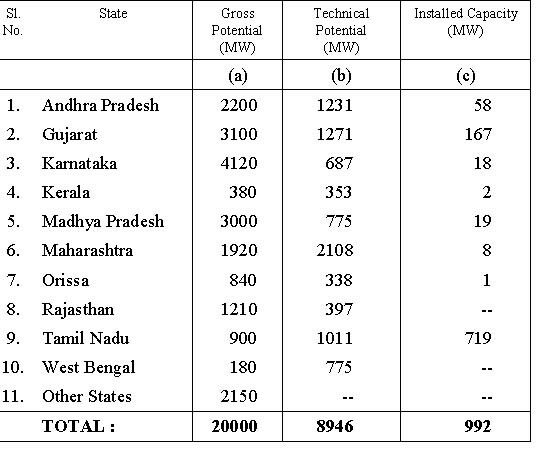 From Table 2 it is evident that the bulk of Windfarm installations are in Tamil Nadu. An analysis of Table 3 reveals that there was a steady increase in windfarm activity from 1992-93 to 1995-96 followed by a sharp decline. Factors which led to steady decline in Windfarm activity in Tamil Nadu. · introduction of Minimum Alternate Tax (MAT) further eroded the gains of setting up Windfarms. · applying windspeed data from limited number of anemometers (two for 300 MW in Muppandal) resulted in wide variation from predicted wind turbine generation and actual generation creating doubts about the viability of wind projects. Although subsidies and financial incentives were given liberally to wind energy, this technology remained marginalised in the over all energy scenario. Wind energy contributes about 1 per cent of the total power available in the country. While working out cost-benefit analysis and calculating internal rate of return for any power project, hidden or indirect subsidies on pricing a resource and infrastructure were never taken into account in the case of conventional energy sources. On the other hand, economic analysis of wind energy projects rarely supported their economic justification. Most projects were supported for their renewable nature, social and environmental benefits. There are number of instances which clearly demonstrate the need to create a level playing field enabling wind energy to compete with conventional energy in India. Lack of adequate financial resources has been a chronic problem for setting up wind energy projects. In India, Indian Renewable Energy Development Agency Ltd (IREDA) played a crucial role in supporting wind projects in the country. IREDA’s lending terms are presented in Table 5. Bilateral development institutions from Netherlands, Denmark and loan from Global Institutions like the World Bank through IREDA also contributed for the boom in wind energy projects in Tamil Nadu. There is the need to create more financial institutions to support wind projects. A wind fund of Rs. 1000 crores (1 crore = 10 million, 1 US $ = Rs. 42) on the lines of the one in UK can be created in India to support wind projects exclusively. Such a fund will provide equity finance for small-scale wind energy projects and will offer investment opportunities to individuals and institutions alike. Transaction barriers to wind energy are similar in many ways to those in developed and developing countries (6-11). In India many of the sources of risk, institutional structures and conditions, experience and skills deficiencies are unique. The result is greater uncertainty in transactions about opportunities, costs, and benefits. Lack of standardisation in system components resulting from the wide range in design features and technical standards, and absence of long-term policy instruments have resulted in manufacturing, servicing and maintenance difficulties of wind turbines. The mismatch between locally manufactured components and imported parts resulted in weakening the reliability of the over all system, in some cases. The absence of effective servicing and maintenance networks, combined with inadequate user-training, resulted in a loss of confidence among entrepreneurs and customers. Another barrier is lack of co-ordination among research groups, academic institutions and private wind industry. These constitute the real constraint, not only to the development of Renewable Energy Sources like wind but also to their wider dissemination. Technologies that are of immediate relevance in a developing country like India are now available and, while improvements may be required in individual cases, especially to reduce production costs, the hardware for harnessing wind energy is relatively well known and reliable. What is required is therefore an appropriate institutional infrastructure capable of planning and implementing a co-ordinated programme at all levels and of mobilising community support for it at the micro-economic levels where it would be implemented. This strategy calls for a different approach that would need to be compartmentalised according to the sources of energy supplies and yet to be integrated and co-ordinated to bring the results to the masses. This new strategy will require an integrated institutional approach involving political will to support it consistently, institutional arrangements to implement it and involvement of the people to sustain it (12). Wind energy is being pushed in India because of its usefulness as decentralised energy system. Its introduction initially generated a good deal of interest from the scientific perspective rather than its potential to meet energy demands on decentralised basis. A growing gap in demand and supply, environmental considerations and the decentralised nature of wind projects made everyone in India realise its significance in meeting the growing energy demand to some extent. Initially, wind projects were promoted in India as panacea for all unsolved energy problems. The main emphasis on wind projects was on the target achievement rather than on consumer satisfaction of capacity building. Little efforts were made to strengthen the institutions involved in the diffusion of wind energy, or provide an enabling environment to the entrepreneur to promote the commercialisation process. This resulted in raising undue demands and expectations that wind energy is unable to fulfill. A multiplicity of agencies has resulted in duplication, overlapping and coordination problems in the implementation of the wind projects. Multiplicity of agencies has also resulted in unnecessary delays. A bureaucratic structure with a target-oriented approach has led to rigidity in instructions and a centralised planning process that is the opposite of the decentralised nature of wind energy. Most of the decisions are still taken at the central level with little flexibility given to the field agencies and grass roots level institutions. Development and successful implementation of a complex technology like wind energy requires sufficient information and inputs of manpower. It is imperative that energy education including wind should be included at various levels in schools, colleges and universities and other academic institutions. Regular four year bachelor degree course in wind energy specialisation will be useful in the design, development and evaluation of this emerging technology. Another success story that needs close examination is the phenomenal success of wind energy in Germany which has been relegated to the top position in the world with installed capacity of 2390 MW at the end of July 1998. The wind energy boom in Germany is mainly due to the renewable energy feed in tariffs (REFITs) granted there, apart from investment grants given initially, and some research activities. All private producers of electricity from renewable energy are statutorily granted a fixed price which the utilities are obliged to pay. The price is calculated on the basis of the average electricity rates in Germany (14). 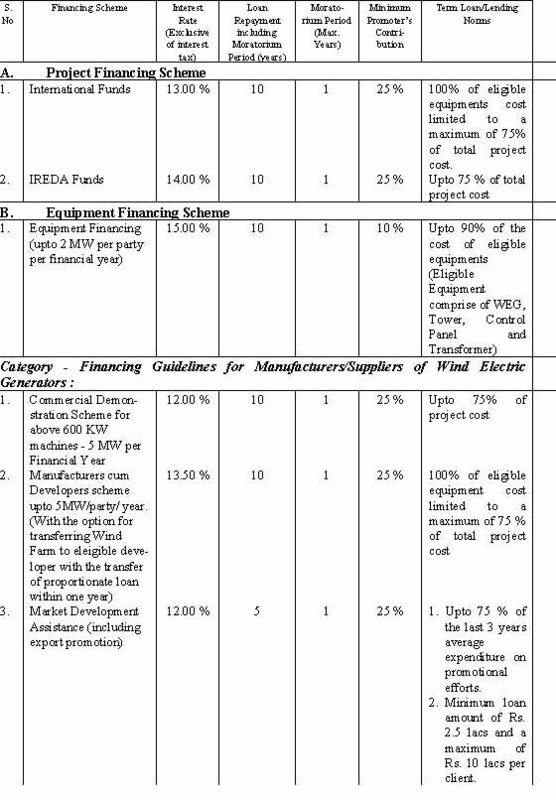 In India currently accelerated depreciation is allowed on wind projects. The main aim of extending this incentive to windfarm owners and developers is that they supplement power to conventional one. Unfortunately in majority of the cases this liberal incentive has ended merely as a tax shelter plan. This has far reaching consequences on the generation of power by wind turbines. It is hightime that the Government seriously considers to link depreciation benefits to generation of power so that the wind turbines produce optimum power. 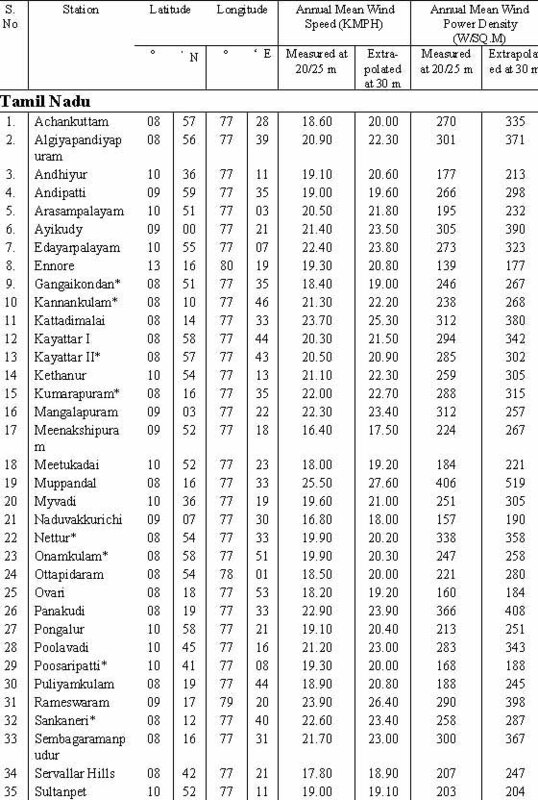 There is wide variation in the incentives offered by different state governments, Table 6. * Policy expired on 31.03.98. It is hoped that Tamil Nadu Government introduces third party sale as well as sales tax benefit like Madhya Pradesh which will go a long way in setting up of Windfarms on a large scale in the state. In Tamil Nadu about 850 water pumping windmills were installed out of which 120 were geared type deep well wind pumping systems. The rest were 12-PU-500 type with 12 bladed pumping unit with 500 cm. diameter rotor fitted to the windmill. The performance of 12-PU-500 windmills has not been satisfactory due to variety of reasons like improper siting and installation, lack of user awareness, design problems, substandard material usage in the fabrication of windmill to bringdown the cost and an improper implementation strategy (15). As wind pumping is a well established technology that offers on alternative to diesel and electric pumpsets, and since there are many areas with good wind regime in Tamil Nadu, water pumping windmills will be a boon to conserve electricity (which is heavily subsidised for agricultural purposes) which can find application in other areas. It is hoped that MNES will promote reliable and sturdy windmills for irrigation in the country in general and Tamil Nadu in particular. Wind energy generators can also charge batteries which can store energy for lighting, radio communication, hospital equipment and to power various emergency-related equipment. In India about 50 wind chargers were installed on a pilot scale. Their performance has not been satisfactory. Today over 100,000 wind chargers are working in Inner Mangolia and studies indicate that levelised costs of off-grid, household scale renewable energy systems are cost-competitive with conventional gasoline gen-sets and pv/wind hybrid systems appear to be an economic means of providing year round electricity service and meeting the rising energy demands of remote households in Inner Mangolia (16-21). Tamil Nadu offers best sites to supply power in a decentralised way to charge batteries through wind. In Andhra Pradesh the installed capacity of Windfarms stood at 57.79 MW at the end of September 1998. About 50 MW of this capacity is at Ramagiri. 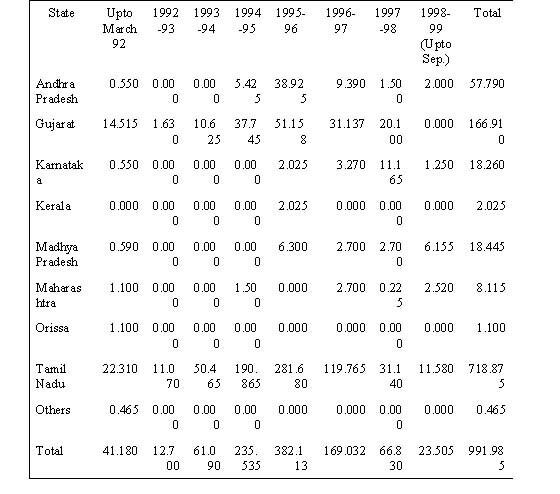 From Table 3 it can be seen that 1995-96 saw a boom with installations totaling 38.9 MW with sharp decline subsequently as happened in Tamil Nadu. · in Andhra Pradesh the land for setting up windfarms used to be allotted by NEDCAP. · Ramagiri has complex terrain. The Consultants and Manufacturers of wind turbines overestimated the generation at Ramagiri based on the wind data from 3 anemometers. The actual generation fell by about 25 percent from estimated generation. This led to doubts in the minds of the investors on the viability of wind projects in Andhra Pradesh. The variation of about 4 per cent of energy between locations 4 and 5 is due to the slope of terrain in the predominant wind direction eventhough both are at the same contour level. This proves beyond doubt that critical micrositing is a must to set up windfarms especially in complex terrain areas. In complex terrain wind data has to be obtained from an anemometer close to the site where windfarms are to be set up. In California during ‘80s there was one anemometer per 150 to 350 turbines or 10-20 MW while in the ‘90s one anemometer for every two or three 200 KW machines or 0.5 MW capacity (23,24). · local problems led to the closure of windfarms for some period at Ramagiri. However the intervention of the Government helped to restart the windfarms there. NEDCAP (Nonconventional Energy Development Corporation of Andhra Pradesh Ltd), Nodal Agency responsible for the promotion of renewable energy sources in Andhra Pradesh has taken effective steps to have a 33/220 KV substation with a ring structure exclusively for evacuating power from the windfarms at Ramagiri. Since most of the identified sites in Ananthapur District in the state are having hilly region, NEDCAP has undertaken contour survey of all the potential areas at 3 meters intervals (25). Another innovative concept initiated by NEDCAP is Wind Estate mainly to assist the small developers in acquiring land and in the procurement of machinery at reasonable prices, erection, operation and maintenance by NEDCAP on behalf of small developers. Work is on to set up 20 MW wind estate at Kadavakallu by NEDCAP. Wind projects of capacity 50 MW are underway in Andhra Pradesh mainly at Kadavakallu, Tallimadugula and Bhimunipatnam. Introduction of sales tax benefits will help to attract investors to set up large windfarms in Andhra Pradesh. In Andhra Pradesh 320 waterpumping windmills were installed but their performance was far from satisfactory. It is hoped both MNES and NEDCAP will promote efficient windmills for irrigation besides wind battery chargers for small applications in Andhra Pradesh. The case study of wind energy developments in Tamil Nadu and Andhra Pradesh reveals that incentives like depreciation, tax holiday, customs and excise duty reliefs should continue for some more years until the wind projects sustain on their own. There is a dire necessity to continue wind data studies by setting up more anemometers/windmasts and that too at varying heights of 20,30,40 and 50 meters to get accurate wind data rather than relying on extrapolated figures. Latest methods like Geographical Information Systems (GIS) have to be utilised for large - area screening of prospective sites for wind power development. Wind speeds at the height of a wind turbine depend strongly on terrain elevation, exposure, slope, and orientation to prevailing winds, all factors which can be calculated from a GIS - based Digital Elevation Model (DEM). In addition, with the appropriate database, a GIS can account for other factors that affect wind site suitability, such as the distance to nearby transmission lines, proximity to protected areas, and type of vegetation cover. The cost of the wind turbines has to be brought down considerably by indigenising the components. Thorough micrositing is a must by competent experts which will enable the investors to choose the best site and matching it with the suitable machines for optimum generation. The Central Government in co-operation with different State Governments can fix uniform incentives for a healthy growth of windfarms in the country. Creation of a wind fund and peoples participation through windfarm co-operatives will give a fillip to the declining wind activity in the country in general and Tamil Nadu and Andhra Pradesh in particular. Before permitting wind projects, the respective State Electricity Boards should ensure that suitable evacuation facilities through a dedicated substation and stable grid are in place. For optimum generation of energy by windfarms, depreciation and other incentives should be coupled to generation of energy rather than mere tax shelter plan. A remunerative price based on the ever increasing tariff by conventional sources should be fixed for wind energy generated electricity which will enable faster growth of windfarms. Since Tamil Nadu and Andhra Pradesh have strong agricultural base, water pumping windmills which are reliable will be a boon to conserve energy as a supplementary to electric and diesel pumpsets in windy areas. The Central and State Governments of Tamil Nadu and Andhra Pradesh should promote water pumping windmills on a large scale. Wind battery chargers have also a role to play in the states of Tamil Nadu and Andhra Pradesh for small scale power applications. The Centre for Wind Energy Technology(C-WET) coming up in Chennai and the Wind Turbine Test Station at Kayathar in Tamil Nadu through DANIDA assistance are expected to fill the gap of setting and ensuring standards to maintain quality in wind turbines. To achieve Ninth Plan (1997-2002) targets in power, an average 9000 MW per year is required to be put up in the country. With improved design wind turbines, financial package, political will to support large wind projects through public sector undertakings and a remunerative price for wind generated electricity, it is hoped that wind energy will play a supplementary role to meet the growing power demand in the country in general and Tamil Nadu and Andhra Pradesh in particular. This is a joint research project with Centre for International Climate and Environmental Research-Oslo (CICERO) and financially supported by the Research Council of Norway. The author is thankful to Dr. Lin Gan of CICERO for his useful suggestions. The sun is an energy source available to everyone, an energy source that can be used simply, and inexpensively to reduce developing countries’ dependence on imported fuels. Solar water heater is the simplest and most cost-effective solar applications. Solar water heaters are based on a common natural phenomenon: cold water in a container exposed to the sun undergoes a rise in temperature. The solar water heater is basically a flat-plate collector and an insulated storage tank. The collector is commonly blackened metal plate with attached metal tubing and is usually provided with a glass cover and a layer of insulation beneath the plate. The collector tubing is connected by piping to a tank that stores hot water for use during non-sunny periods. When mounted on a roof or other suitable support, the collector absorbs radiation, by transfer of resulting heat to water circulating through the tubing, hot water is supplied to storage tank. In the most common designs, the storage tank is located above the top of the collector. The elevated position of the tank results in natural convection: water circulates from the collector to the tank. When Solar water heater technology is so simple, how is it that developing countries are yet to catch up? The reasons are not far to seek. The main constraint is prohibitive cost. For e.g. In India a 100 litre solar water heater costs around Rs. 12,000/- (about US $ 300). Another Interesting point is that not many people living in towns and villages have access to overhead water storage tank to get continuous supply of cold water. To overcome the above barriers, the author designed and tested a vertical and cylindrical Solar Water Heater. Two vertical and cylindrical collectors made of stainless steel (normally used in the manufacture of drinking water drum) of height 0.6 m and diameter 32 cm are made and placed one over the other with thermocole in between as well as at the bottom to prevent heat losses. The top cylindrical auxiliary tank is provided with an inlet at the top and provided with a cap and the same is provided with an opening at the bottom, which is connected to the bottom cylinder with a hose pipe (strong enough to withstand high temperature). There is a lever attached to the pipe to control water flow. The bottom cylinder is provided with outlet at the top from which water is drawn. Both the cylinders are provided with concentric rings to provide gap and covered with high-density transparent polyethylene sheet to simulate green house effect. A lotus flower shaped reflector (as shown in the picture) made of stainless steel acts as a reflector. This takes into account the diurnal motion of the sun. The insulator is made of bamboo basket of dimensions height 1.3 m and diameter 45 cm (circular) and covered with 6mm glass wool (rock wool) and over it with transparent polyethylene cover so that the whole setup is airtight. The collector is filled with potable water in the morning at 8 a.m. and is covered with the insulator (bamboo basket) at 4 p.m. The hot water can be used either in the evening, night or next morning. Hot water upto 700 C is obtainable depending on the sunshine. In 15 hours of storage about 70 C drop in the hot water temperature is observed. This 100 litre unit costs around Rs. 6,000/- (about US$ 150) in South India and will be highly useful as a pre-heater for cooking, for bathing, for washing cloths and utensils, for rural schools, hospitals etc. Ø The unit is mobile, modular and easy to install and dismantle for transporting. Ø No necessity of cold water supply through pipes. Ø No need for over head storage water tank. Ø There is no need to have separate collector as it is an integrated system. Ø Since the collector is made of stainless steel, the hot water will be hygienic. Ø Because of the omni-directional reflector, relatively higher water temperatures are obtained even in moderate sunshine. Ø The unit occupies less space being vertical and circular, on the ground or roof. Ø All the materials used in the fabrication of this simple and cost-effective solar water heater are available locally. Ø The unit is durable except that the polyethylene cover has to be replaced once in 4 months, which costs just Rs. 30/- (about US 70 cents). The United Nations Conference on Desertification (UNCOD) held at Nairobi in September, 1977 proposed the plan of action designed to link national schemes to "re-green" deserts through out the world. It is proposed that the plan should start in 1978 and be implemented by the end of the century. In fact Reafforesation will bring rewards. Among many impressive examples, one of the most striking is in Saudi Arabia where the highly fertile El Ashsaa Oasis, watered from underground aquifers, was threatened by sand dunes. Since 1962, 10 million tamarisk, acacia and eucalyptus trees have been planted on 500 hectares. Encroachment has been checked and 14 villages have been saved from the dunes. As a follow up action to the proposal of UNCOD, I have drawn a scheme of "AFFORESTATION". There are millions of hectares of waste land. Can’t something useful be exploited from this ? The forest area compared to the total area in square Km. State-wise is given below. Oleic Acid	:	Soap base, manufacture of oleates, ointments, cosmetics, polishing compound, Lubricants, ore floatation, organic synthetic intermediate, surface coatings. Linoleic Acid	:	Soaps, special driers, for protective coatings, emulsifying agents, medicine, foods, feeds, biochemical research. Palmitic Acid	:	Starting point in the manufacture of various matallic palmitates, soaps, lube oils, water proofing. Stearic Acid	:	Chemicals, especially stearates and stearic driers, lubricants, soaps, candles, pharmaceuticals and cosmetics, rubber compounding, shoe and metal polishes, coatings, food packaging. The oil in general is used in the manufacture of paints and varnishes. In normal years, the per capita availability of edible oil in the country averages 3.5 Kg.and about 1 Kg. of Vanaspati, as against 25 to 30 Kg. in western countries. The total requirement of vegetable oils in the country, as of today, is estiamted at 40 lakh tonnes, compared to the present availability of 30 lakh tonnes. There is thus a gap of 10 lakh tonnes. It is estimated that by 1980-81, the demand would go up to 55 lakh tonnes, while the availability would be around 35 lakh tonnes. The gap would, therefore, widen to 20 lakh tonnes. The reasons for this are not far to seek. The acreage available for oil seeds cultivation would further diminish due to a corresponding increase in the cultivation of rice and wheat, on the one hand, and the faster increase in population on the other. The situation is, therefore, quite alarming. If this shortfall has to be met by imports, it would mean a foreign exchange drainage of about Rs.1,000 crores a year as of now, and about Rs.2,000 crores by 1980-81. We cannot afford it at any rate. And, hence need for an alternative. It lies in tapping the entire tree and forest origin seeds generally known as minor oilseeds – which are now going a waste. In the entire forest belt of Assam, Nagaland, Manipur, Tripura, Arunachal Pradesh, Border of Nepal, Bihar and West Bengal, M.P., Orissa, U.P. 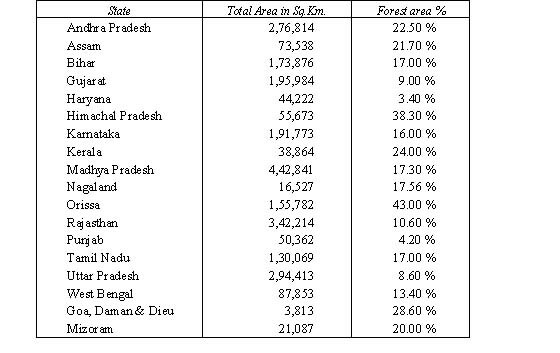 and some parts of Maharashtra and Karnataka, hundreds of trees and forest based oil seeds are abundantly available. Some of them are : Salseed, Mango Kernel, Neem Seed, Babul, Mahua, Kokum, Palm, Date, Nahor, Undi, Pisa, Karanja, Kusum Seed, Jackfruit Seed, Bobbie, Maroti, Eurahonne, Mahera, Rubber Seed, Ratahjot, Tamarind Seed, Kamala, Dhupa, Tea seed, Jute seed, Tobacco seed, Khakan etc. - by no means an exhaustive list. Sal Seed : The total potential of Sal Seed, particularly in Orissa, M.P., U.P., Bihar and West Bengal, is estimated around 60 lakh tonnes a year. Its collection started as late as 1967 on a very modest scale, and although the collection has increased, it is till 1.2 lakh tonnes a year, hardly 1/60th of the total availability. Neem Seed : Its potential is also quite high, since it is available all over the country. A modest estimate puts it at around 20 lakh tonnes, but very little is being collected now, hardly 1 lakh tonnes. Mango Kernel : The other important minor oil seed is mango kernel and its total potential is about 20 lakh tonnes a year, but, its collection throughout the country now is hardly 10,000 tonnes a year. Other Minor Oilseeds : Other minor oil seeds which would include Mahua (one million tonnes), Kusum (2 lakh tonnes) Khakan (2 lakh tonnes), Karanja (5 lakh tonnes), Kokum, Babul, Undi, Dhupa etc., would have a total potential of about 10 million tonnes a year. Thus the total potential of minor oil seeds all over the country can be safely estimated at 2 crore tonnes. (Source : Oil seeds – Wealth from waste, Indian Express, by Prof. N.SEN, Chief Executive, Minor Oils and Oil seeds Association of India). The Government vacant lands can be assigned to Educational Institutions on long term lease basis. A nominal amount of Re.1/- per hectare per year can be charged. We have many canals and tanks. We can plant Euclyptus, teak and Casurina on the banks. Since these canals carry water rich in minerals, these trees grow wildly. As the trees grow erect, they won’t be any obstruction. Besides yielding fire wood it will prevent soil erosion. The Greenery provides protection to the eye, besides maintaining ecological balance.